"Designer dogs" are a relatively recent breeding trend in the dog world. The term refers to breeding two different purebred dogs to create a third breed that combines the traits both. One such designer dog is the Goldendoodle, a combination of the Golden Retriever and the Standard Poodle. The earliest known breeding of the Goldendoodle was in North America and Australia in the 1990s. Small poodle hybrids had become popular by that time and breeders decided to create a larger crossbreed between Golden Retrievers and Standard Poodles. Smaller hybrids were also created when breeders used a miniature or toy poodle as one of the parents, and these designer dogs are called Miniature Goldendoodles. 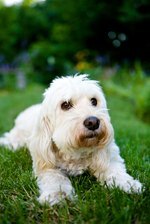 Although Goldendoodle, or mini Goldendoodle, is the most common term for this crossbreed, depending on its size, they also have other nicknames, including Golden Poos, Goldie Poos or Groodles. The size of a Goldendoodle mostly depends on its parentage. To estimate the adult size of a Goldendoodle puppy, add together the weights of both the parents and divide by two. This helps breeders and owners get a rough estimate of what to expect. Standard Goldendoodle sizes are the largest classification of Goldendoodle. These designer dogs are generally more than 45 pounds as adults, but they can grow to more than 100 pounds. Medium-sized adult Goldendoodles are usually between 30 to 45 pounds. The full-grown Miniature--or Mini--Goldendoodle most often reaches 15 to 30 pounds. With the Mini Goldendoodle, owners get the friendly, obedient, outgoing personality of the larger Golden Retriever in a smaller, more manageable package. In addition to a smaller size, the Miniature or Toy Poodle side of the breed also brings with it intelligence and a low-shedding coat, which makes them a good choice for people with allergies. Caroline Shurr began writing professionally in 2002 as a freelance writer for "Acadiana LifeStyles." She later joined the staff of several newspapers as a reporter, including "The Daily Sun" in Florida. She has has written on a variety of lifestyle topics, including health, home and garden, religion and the arts. Shurr holds a Bachelor of Arts in English from Louisiana State University.